UK – To mark World Autism Awareness Day on 2nd April 2016, PRG XL Video partnered with The Jigsaw Trust to light Guildford Cathedral blue for the “Light It Up Blue” campaign. The campaign sees buildings and landmarks around the world changing to blue to raise awareness for Autism globally and to kick off International Autism Awareness Month during April. 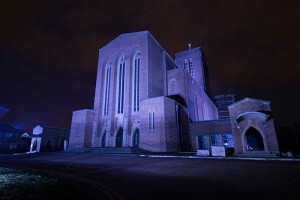 From the evening of 31st March to Monday 4th April 2016, the night-time floodlights which accentuate the modern Guildford Cathedral building were changed from orange to blue – the signature colour of the Autism Awareness campaign. 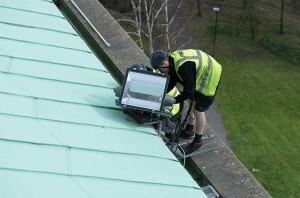 To achieve this change, a team of staff from PRG XL Video visited the cathedral on 31st March to switch lamps in the floodlight fixtures in the grounds of the building, and up on the roof. This is the fifth year PRG has worked with The Jigsaw Trust to make this change at Guildford Cathedral, and the Dean of Guildford, The Very Reverend Dianna Gwilliams, the Jigsaw Trust’s CEO, Kate Grant, and PR and fundraising officer, Steven Morgan, visited the venue to see the changeover being carried out. 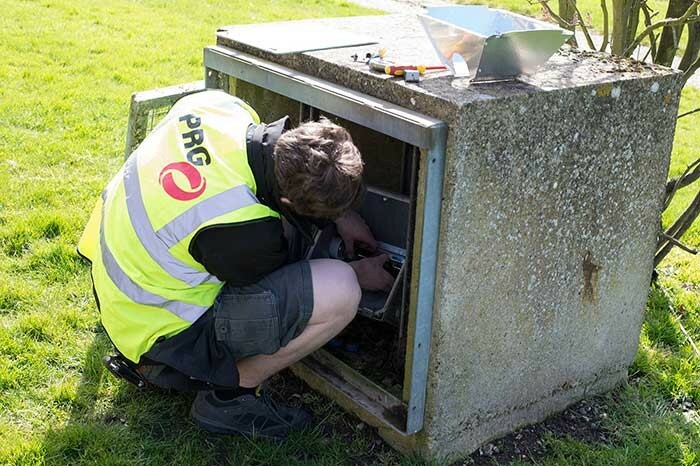 PRG XL account manager, Cameron Bannister led a team of four crew – Bradley Stokes, Christopher Ashton, Simon Port, and Russell Harris – changing the lamps. The work included some height work for the team, climbing on to the cathedral roof and tower to make the changes.